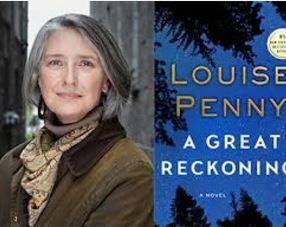 Louise Penny Has Done It Again!”A Great Reckoning” Is Great! I admit it! I’m an unabashed Louise Penny fan! And I’ve read every single one of her terrific mystery/crime novels about Quebec’s former Chief Inspector of the Surete, Armand Gamache, but with her newest one, “A Great Reckoning” she’s done it again! “A Great Reckoning” is great! The best so far. She’s really topped herself! I haven’t been able to do anything since I picked up this 12th book in her Gamache series. And neither will you! It’s what a page-turner should be. Suspenseful, taut, fast-paced, totally absorbing and thrilling with a capital “T”. I’ve read an early critic’s edition, as it were, so there are limits to what I can and can’t say. I can’t quote from it, but I can say there are beautiful descriptions of her beloved Quebec and the irresistible village of Three Pines. You really want to move there and retire, just like Gamache & his devoted, smart, beautiful wife Reine-Marie have. Except of course, it’s a fictional location where corpses and murders abound. And it’s in Quebec, where it’s almost always snowing.And her descriptions of the food Olivier & Gabri prepare in their adorable bistro ~ MOUTH~WATERING! Also writing about a thriller like this is difficult, because you can’t reveal any of the mysteries, or you’ll spoil it. And suffice it to say that there’s a LOT to spoil. There are twists upon twists, and a really bang-up unguessable conclusion. And all your favorite characters, the colorful Quebecquois townspeople, are all back, Clara, Myrna, Ruth Zardo and her pet duck, Rosa. And the gay couple to end all gay couples, Olivier & Gabri, and their wonderful bistro/B&B, that you’ll wish you could dine at and stay at. But alas! They’re all fictional! But that’s the sign of great writing. It all comes alive for you, Penny tells her stories so well. Taken altogether as one massive novel, it reminds me of “War and Peace”! That’s how the Gamache series deepens and grows on you.Throughout the twelve preceeding novels(and you really should read all of them, in order, if you can), the characterizations just build and build and build til you feel you know Clara & Myrna & Ruth etc.,etc. It’s like visiting old friends, in their loveliest of homes. But you can read the Gamache series of mysteries and enjoy them as stand alones, too. This mystery is set in the Montreal Police Academy, which has made Gamache its’ head and lured him out of retirement, and the scenes shift between the school and Three Pines, but I will say no more than that. No spoilers here! “A Great Reckoning” hits stores August 30. But you can pre-order, mais oui! And as strong and suspenseful as “A Great Reckoning” is, it’s even MORE amazing how quickly after Penny’s last Gamache book ,N.Y. Times bestseller “The Nature of the Beast”, came out. Less than a year! How does she do it? But then that’s the timetable Agatha Christie kept to and Louise Penny is nothing if she’s not a modern, French-Canadian Agatha Christie. Miss Marple had St. Mary Mead and Gamache and co. have Three Pines. Murder mysteries set in small, cozy, seemingly idyllic villages. And when you read her acknowledgements at the end, she heart-breakingly reveals that her much-loved husband Michael has gotten dementia. And they live together in a small village in Quebec’s townships. but it’s not Three Pines. So her writing this wonderful, complicated thriller so FAST and so WELL is even more amazing! That she wrote this great book in the middle of all this personal sorrow and tragedy is astonishing. All my best to Louise and to Michael, too. The always surprising Montreal Film Festival is celebrating its’ 40th year with another innovating, interesting step for 2016. Read the press release below but the Festival has been given $1 million dollars US to be divided among the winners of its’ many competitive categories. That’s awfully nice for the filmmakers involved, should they win. This will be my 18th year returning hopefully to the MWFF as it’s abbreviated, and it’s always a delight and an astonishment.It happens at the tail end of August this year and the first week of September. To celebrate its 40th anniversary the Montreal World Film Festival is introducing a GOLDEN CHELEM of World Cinema: $1 million (US) in cash prizes will be added to the awards for its competitive sections. The prize money will be shared equally (on a 50/50 basis) by the producers and directors of the winning films, in order to encourage new cinematic creation. “No other festival in the world rewards its best films in such a generous way with 13 different prizes.” stated MWFF Chairman Serge Losique. 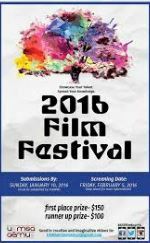 With this initiative, MWFF ignites a “genuine revolution” in the organization of an international film festival. A generous benefactor has undertaken to sponsor these prizes. He acknowledged the Festival’s s prominence and hard work, accomplished both at home and on the international scene over 40 years. The prize money will be deposited in-trust at a notary’s office in Montreal, so that it could only be used for that purpose at the MWFF’s Awards Ceremony on September 5, 2016.